Unveiled in 1863, two years after his death, the statue recalled the visit of Queen Victoria and Prince Albert to Guernsey in 1846. It is a bronze statue set on Cornish granite depicting Prince Albert wearing the robes of the Order of the Bath. Address: Albert Pier, St Peter Port. Parking: Public car park on the Albert Pier. Though commonly known as the 'Fairy Ring' and often linked to folkore tales the Table des Pions is in fact one of the few existing reminders of the cavalcade known as the Chevauchée. The task of the Chevauchée was, in more recent times, to keep the King's highways clear, however many have speculated that this role was superimposed on a much older tradition. Accessible via pedestrian road from Portelet Harbour or cliff path from Pleinmont headland. Parking: Parking at Portelet / Pleinmont headland. Unveiled on March 1st, 1900, this statue was erected to mark Queen Victoria's Diamond Jubilee. The statue is bronze, by the sculptor C. B. Birch, A.R.A. It is a replica of those erected at Aberdeen and on the Thames Embankment. The queen is portrayed in Imperial regalia with orb and sceptre. Candie gardens are open dawn to dusk every day. Parking: Parking at the Odeon car park / Candie Road. Victor Hugo spent a number of years in exile on Guernsey and it was during this time that he wrote several of his famous books. 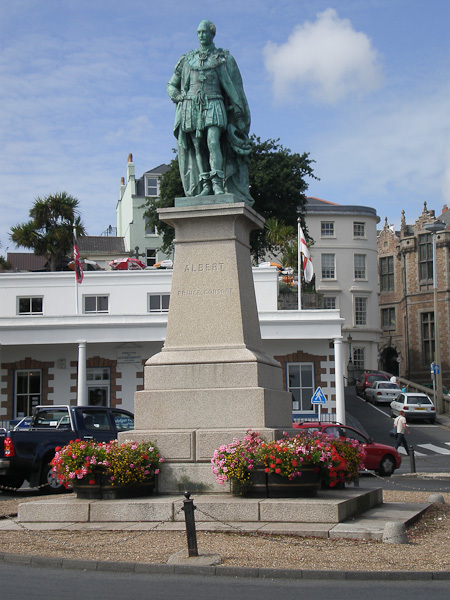 In recognition of Guernsey's hospitality to Victor Hugo the French Government decided to present the Island with a statue of the famous exile. It was made in around 1913 for the Sociéte Victor Hugo and was purchased by the French government for the sum of 30,000 francs (£1,291). The statue was publicly unveiled on the 7th July 1914. Parking: Public car park at the Odeon car park / Candie Road.